We’ve been talking about Omaha, explaining the basics and a little more. By now you must have already signed up and must be playing as you read, but if for some reason you haven’t don’t wait any longer, sign up now at http://www.regalpoker.com while we share some more tips. Because of the possibility of having so many better hands, you should be cautious, remember that an opponent may just be calling your bets with a set of kings or queens as they may fear a straight or flush, so even if you are not facing any immediate aggression, you could be beat. Similarly in Omaha 8-or-better, one must be weary of what the nuts are for both halves of the pot and also cautious of players sharing the same hand. Just like in hold’em, position is an important element in Omaha. Many consider it to be even more important when taking into account all the possible combinations a player can make with an Omaha hand. When sitting in position, you can follow the actions of your opponents and make your decisions based on the information you received. When out of position, it is much harder to make the correct decisions because you are dealing with incomplete information more often. Another benefit of being in position is that you have a better chance of controlling the size of the pot, which is often based on the strength of your hand and your overall goal in the pot. Being out of position to one opponent or more gives them the ability to control the pot size and also capitalize on the added information of knowing your actions first. Because Omaha is so focused on the nuts, it seems like an easy game to bluff. 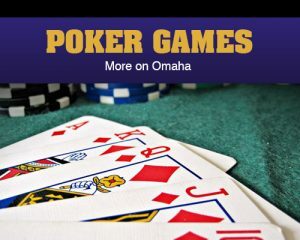 A player can represent a wider range of hands in Omaha, and also open up their game a bit more with many more semi-bluffs available. The more you learn about the game, the easy it will become to pick up on these spots and determine how to proceed against various opponents. It is in this regard that “blockers” also become much more prevalent in Omaha than in Texas hold’em. Blockers are those cards you hold in your hand that prevent an opponent from making a specific hand. For example, if a board reads and you hold the in your hand but no other spades, you may not have a flush, you you know your opponent cannot make the nut flush. This gives you added power in the hand being able to push your opponent off certain hands as he is guaranteed to not contain the nuts. Omaha poker is a game of action, but it can also be a game of big swings. Many players first learn Texas hold’em before taking up learning the rules of Omaha. Having a good base of knowledge in Texas hold’em helps a lot when making the transition into Omaha. Get all the latest Betting and Sport News updates on your social media outlets. Find us on Facebook!